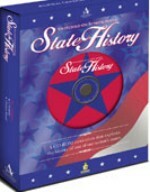 State History was developed so that students will learn to identify the history and resources of the state in which they live. This is a fabulous program on CD-ROM for students in grades 7-12. The program encompasses more than history, and it is essay and research driven. This makes it an excellent program for enhancing writing skills, applying math skills, learning about businesses and resource planning. This program surpasses other state history curriculum by requiring students to use critical thinking skills, not rote memorization. Unlike other state history curricula, this offers detailed information on Christian heritage and influence for each state. It includes lots of instruction on how to use the library, where to find sources for research and how to document and format a paper. Conducting research on the Internet is also included, but it is not required to use the program. Students will learn to write persuasively and clearly, an academic skill that they will use for the rest of their lives. Recommended Computer System Requirements: Multimedia PC, Pentinum 133 or better, 16-bit sound card capable of 22,050KHz or better, SVGA video card capable of 640 x 480/256 colors, Minimum of 4x CD-ROM, Windows 95/98 (Not Windows NT), Printer recommended, 12MB min. free disk space. Note: All sales on CD-ROMs are final. Order NOW before we are out of YOUR state! They are going FAST at this price!